We stayed in the hotel just long enough to unpack and admire the view over the hills beyond the town and then we went outside to explore. Opposite the hotel was a bar with pavement tables on a promontory overlooking the bay and the blue sea and with a stunning view of the brooding mound of Vesuvius on the opposite side so this was the perfect spot to sit and have a drink and get our bearings. I think I mentioned that this was our first time away so we were both feeling a bit strange and very unfamiliar. 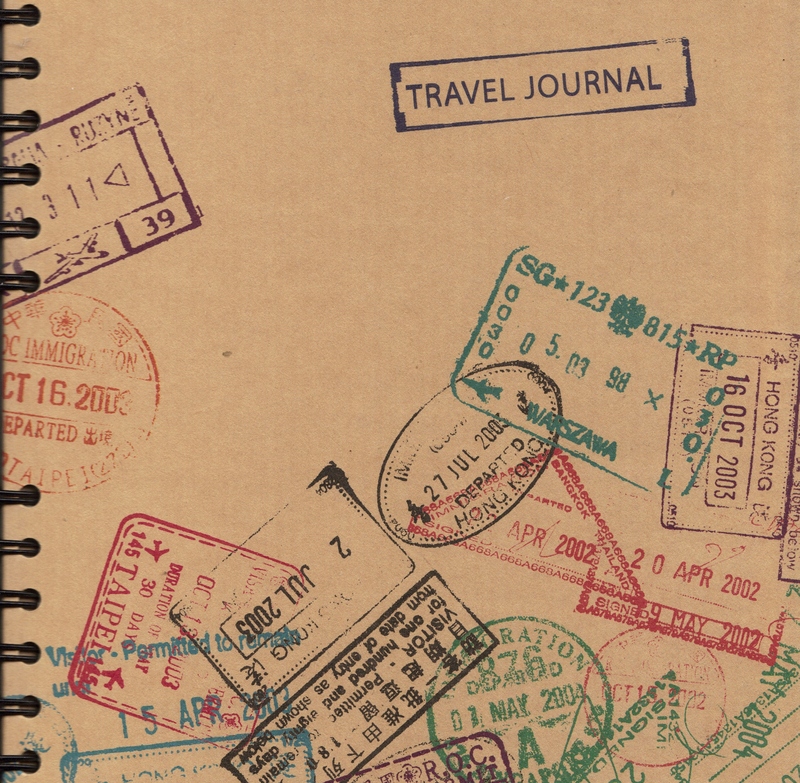 It is hard to remember how different travelling was thirty years ago. Staying in touch was tricky because there were no mobile phones, no satellite television with United Kingdom news broadcasts and whilst I could happily do without those today there were no bank debit cards or ATMs if you ran short of cash, which I now find rather handy. Getting holiday spending money estimates right was quite important because getting a top up if you needed one was a real problem. Dad and I had taken £60 each for spending money, which I suppose would be about £200 now and although this didn’t sound a lot we were on full board arrangements at the hotel and I didn’t drink quite so much beer in those days! 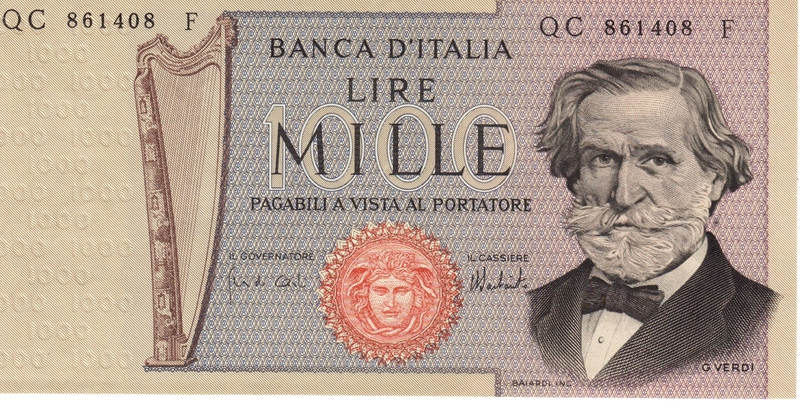 In 1976 £60 in sterling converted to several thousand Italian Lire and so for a few days we were able to spend as though we were millionaires. It was pleasantly warm but not hot enough for dad to take his tie off just yet but he didn’t look that conspicuous because holiday clothing too was different in 1976. Sorrento is a smart resort and most people, although generally speaking dressed more casually than dad, all looked well turned out and tidy. 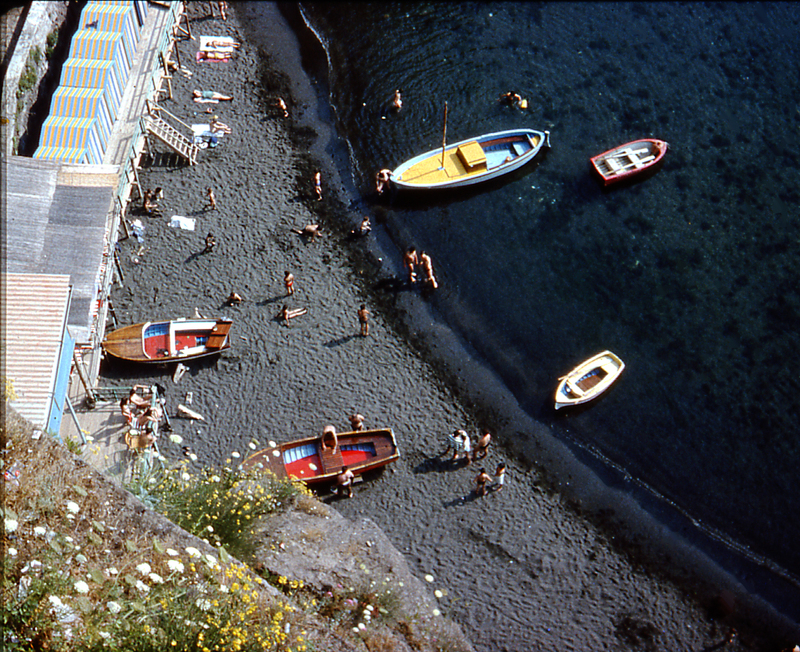 We walked a little way along the cliff tops looking down over the small beaches of black sand with wooden bathing platforms built out into the sea and the colourful fishing boats bobbing indolently on the occasional gentle wave. On the balustrades were plant pots full of gaily-coloured geraniums spilling over the sides and every few metres there were seats to stop and sit and admire the views. We liked it here but being unfamiliar with our location we didn’t walk too far on this first day. In the late afternoon we had been invited to the Cosmos welcome meeting and as we thought that this was probably compulsory we went along to the hotel lounge with all the other guests to get the information that Cosmos thought we all needed. Later on, on package holidays, I stopped going to the welcome meetings because they began to tell you less and less and only wanted to sell you more and more but this one turned out to be very worthwhile. The holiday representative was an attractive Italian woman called Maria who was very informative and gave us good advice before she sold us our trips. 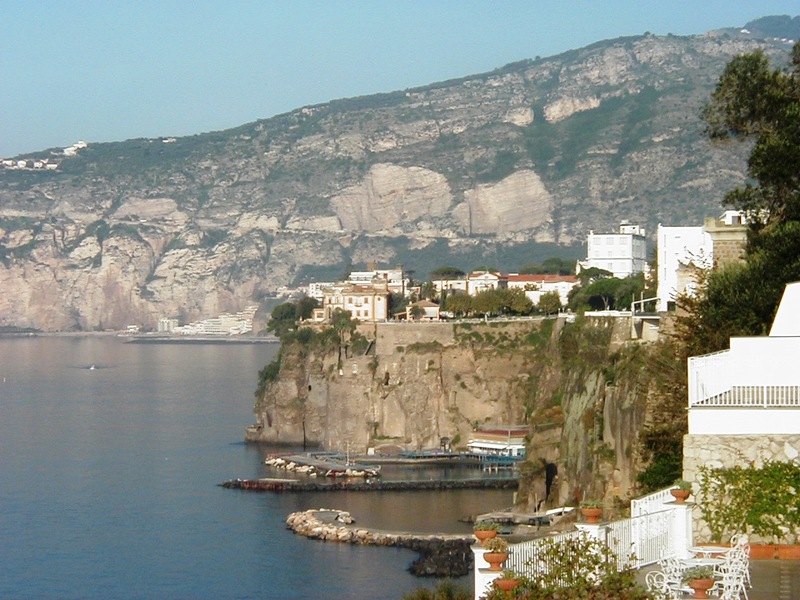 We planned our fortnight to go out every other day and chose to go to Amalfi, Capri, Naples, Vesuvius, Pompeii and Rome as well as two entertainment nights in Sorrento. That was just about everything that was on offer although we did pass on the Monte Casino option. Trips must have been a great deal cheaper then and much better value for money because even after we had paid for them all we still managed to have plenty of spending money left over. The hotel restaurant was on the very top floor and had a balcony with an absolutely stunning view of Vesuvius and of Naples. There was a three-course meal tonight, and every night after that, which was always quite simple but consistently delicious. You have to bear in mind here that apart from Heinz spaghetti on toast we hadn’t really discovered the delights of pasta back home so the food this holiday was genuinely a whole new experience. The hotel was full but in a colonial sort of way didn’t appear to be too busy and after dinner we chatted to other guests and then started a routine that continued for most of the rest of the holiday and we would cross the road outside to the little bar where I would finish the day with a couple of beers and dad would have a coffee on account of the fact that quite frankly he was always a bit of a let down as a drinker. This entry was posted in Europe, History, Italy, Travel and tagged Culture, Hotel Mediterraneo, Italy, Life, Mount Vesuvius, Naples, Sorrento. Bookmark the permalink. I love Sorrento! I am a little biased, my son was born there. Your memory never ceases to amaze me – you still remember the lovely Maria’s name after 37 years! Believe me – if you had seen the lovely Maria you would also remember her name!